To get a great answer, you need to ask the perfect question. 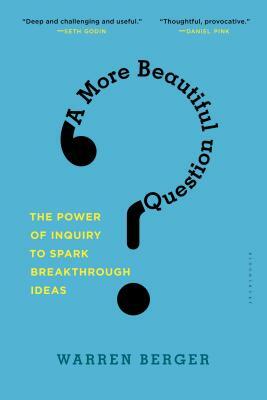 Warren Berger revives the lost art of questioning. Warren Berger has studied hundreds of the world's leading innovators, entrepreneurs, and creative thinkers to learn how they ask questions, generate original ideas, and solve problems. His writing and research on questioning and innovation has appeared in Fast Company, Harvard Business Review, and Wired. He is the author of The Book of Beautiful Questions and the internationally acclaimed book Glimmer, an in-depth analysis of creative thinking that was named one of Business Week's “Best Innovation & Design Books of the Year.” Berger has appeared on NBC's "Today Show," ABC "World News," CNN, and NPR's "All Things Considered." He lives with his wife Laura E. Kelly in Westchester, New York. www.AMoreBeautifulQuestion.com.